To me this is what broght EC back into the limelight after his tragedy. I taped this off MTV the night it was first broadcast, bought the cassette and tab book to go along. Have been stealin' notes for 16 years! Like everything this man does, but most of all would like to ride in his trick '40 coupe! I Can't believe how amazing this album/DVD is! I just saw Clapton at the Crossroads Guitar Festival in Dallas...HE IS INCREDIBLE! I am collecting all his work and without a doubt would suggest this one as anyone's first buy! It is the easiest introduction into what might blow your mind away if you jump straight into the electric stuff. 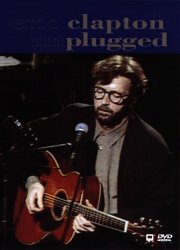 Take it slow and start with the Unplugged. Then move onto From the Cradle, and Cream. WOW! God Bless you EC! And all you reading this. I wish I could rate this album and 11! Everything in it is wonderful to listen to. Being only 16 and not having my license yet lets me listen to this album on the bus before and after school. I take it with me everywhere. I sure wish that Eric would make something like this again. Wonderful job. I listen to it every day. I'm still trying to master "Layla", great song. Eric, you should send me some pointers! Everyone, get this CD and DVD, it's worth it 100%!